Safety is our number one priority! And making you feel comfortable in the water and on your board is our aim and objective. To ensure you receive this attention, all of our lessons are instructed in small groups; ranging from one to five students. 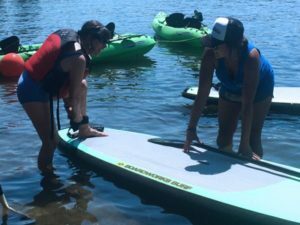 During your lesson, you will learn: how to stand up on your board, paddling techniques, turning tips and tricks and other important safety information. All lessons include a rental board, paddle & personal floatation device (PFD).